Creating Privacy Using Portable Walls - When Hollywood Came A Knockin', Screenflex Started Rockin'! At Screenflex, we occasionally receive rush orders for our products and we like to think we always go the extra mile, doing whatever it takes to “make it happen” for our customers. Recently, Consultant Kim St. Clair did just that for a customer in California. 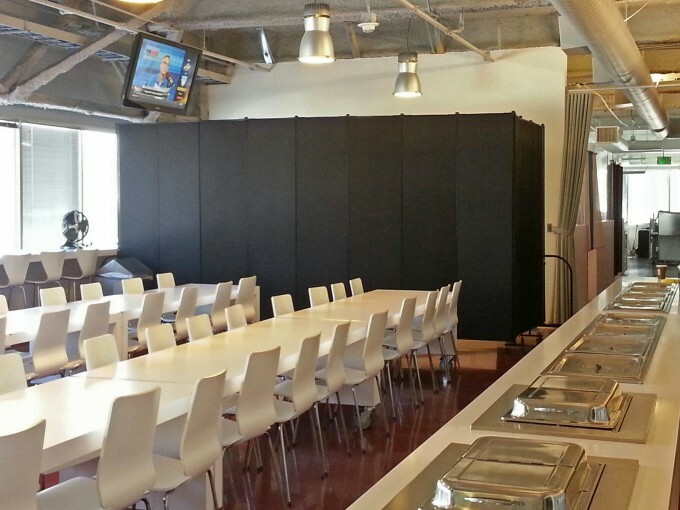 Tracey Weissman, Director, Facilities & Operations at Trailer Park, Inc. needed to find a way to wall off a section of their lunchroom to create a semi-private conference area for meetings. She decided that the best solution was creating privacy using portable walls. Armed with this thought, Tracey found Screenflex Portable Partitions on the internet, and later in the afternoon of June 16, 2014, made the call that solved her problem. Tracey’s call was answered by Screenflex Consultant Kim St. Clair, and the rest is history. Tracey told Kim that their company was growing at a quick pace, and had maxed out all the available space on their current floor. While they waited for the floor above them to become available, she needed to create a private, temporary area in their cafeteria… and she needed to do it by 6/30/14. They wanted something sleek (black is always in fashion and very slimming too!) and it had to fit under the building’s existing mechanicals, as well as a ceiling mounted television. But that wasn’t all! She went on to tell Kim that along with her specific specifications, she also had a very tight deadline; she needed to take delivery of the divider in just 2 weeks! Not a problem for Kim! Kim worked out the measurements, found just the right size divider in the perfect Colors, checked production specifications with our factory, and then emailed Tracey a quote for the project the following morning. With an approved quote in hand, the divider shipped out just 2 days later! Tracey took delivery of the divider on the 26th. Tracey was nice enough to follow-up with an email to Kim, telling her that it all turned out exactly as they had envisioned, and she also sent these photos. I can’t thank you enough for helping me not only get the Screenflex in on time, BUT you sized it perfectly!!! It fits exactly how I needed it to. You made me look like a star!!! ~ Tracey Weissman, ‎Director, Facilities & Operations, Trailer Park, Inc.
Because Screenflex Dividers are not permanent walls, you have the flexibility to divide space anywhere you need it. Tracey will be able to use this divider anywhere in the facility, and because it’s so easy to break down and set up, they’re sure to find a million other uses for it. Creating privacy using Temporary walls is easy and affordable. And even in multi-level facilities like Trailer Park, where you would need to transport your divider on an elevator, our rugged, and self-leveling steel casters allow our units to roll easily over uneven surfaces. Our unique end frames allow you to grasp the divider firmly at waist level. Not only does this design lower the unit’s center of gravity, but also it lets you easily push and “steer” the divider with unobstructed sight lines. Wall Dividers Preserve What's In The Kitchen!